An ankle twist (otherwise known as an ankle sprain or strain) is an injury to ankle ligaments, muscles, and/or tendons. It can cause mild to significant tenderness and pain to the touch, mild to severe swelling of the ankle and foot, and mild to severe bruising or discoloration of the skin. Depending on severity, the ankle may not be able to bear any weight or have any range of motion. Those who suspect an ankle twist (sprain or strain) should call us immediately to get an appointment for diagnosis and treatment. Delaying treatment can make the injury worse. Dr. Richardson has 18 years of experience in treating ankle sprains and strains with young children, adults and more mature patients. A sprained ankle may need an X-Ray to identify possible fractures. We have a state-of-the-art digital X-Ray system on-site to save our patients time and cost. Our system has the flexibility to perform imaging while the patient remains in a wheelchair to avoid bearing weight on an ankle. It's important to get the correct diagnosis of ankle sprain vs. strain, so that the correct treatment protocol can be given. The best results are when treatment can be started very soon after injury. Depending on the degree and nature of the injury, treatment may include wearing a brace to support the ankle as it heals. We keep braces in stock at our clinic. Although it's rare, severe or chronic ankle sprains and strains may require surgery. 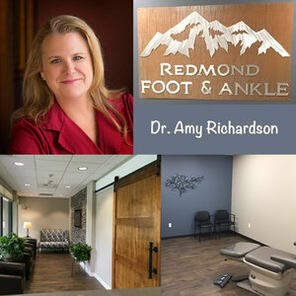 Dr. Richardson performs ankle surgeries at nearby hospitals. Patients who require surgery need extra time to recover, as well as physical therapy for weeks to months.